A Peach of a Pudding | Jake & Sam -- Let's Cook! You may have noticed that, unlike most food blogs, this one isn’t loaded down with desserts. The reason is that we’re not all that creative in this field and actually prefer a piece of cheese or fruit at the end of a meal. Best leave the sweet stuff to the experts. When a birthday or other special occasion demands something more, we fall back on one of the local patisseries here in France and, as often as not, the local Safeway in San Francisco for their gaudily decorated chocolate supreme birthday cakes. Some in the family just can’t get enough chocolate. 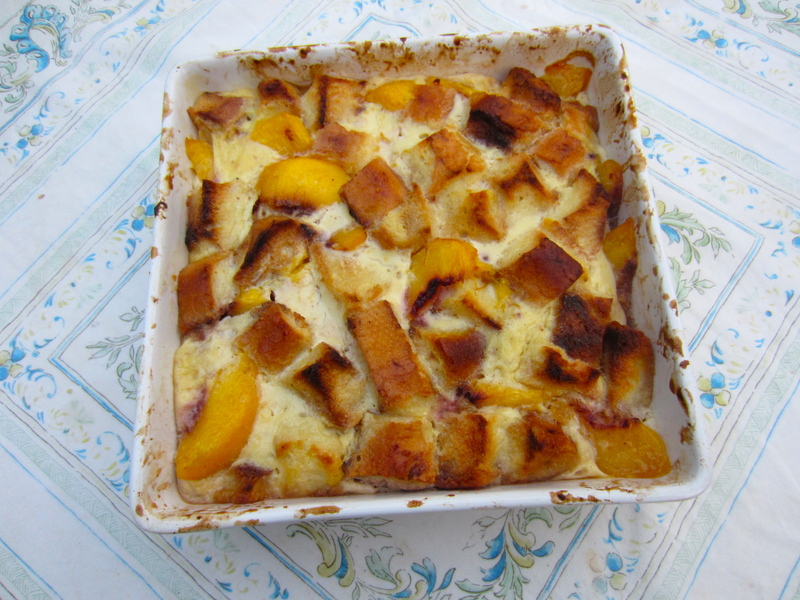 But the beautiful peaches we bought at the market yesterday made us think with longing of Richard Olney’s Peach Bread Pudding. We haven’t made it in a few years mostly because it has a zillion calories in each serving, even without the crème fraîche we like to ladle on top. But an indulgence every now and then can’t be that sinful, particularly when the memory of the last bite sustains you for a couple of years. Preheat the oven to 350 degrees. Melt half the butter in a large frying pan and cook the bread over medium heat, tossing it until it’s lightly golden and crisp and adding more butter as necessary. Empty into a buttered baking dish. Plunge the peaches into boiling water for 30 seconds to loosen the skins. Peel them and cut into fairly thin slices. Scatter the peaches over the bread, tucking them in to form a fairly even surface. Whip the sugar into the eggs, then whisk in the half and half. Pour over the bread and peaches – it should just about cover them. Bake for about 35 minutes until the custard is set. Serve tepid, with cream if you like.